We previously admired the timelapse video skills of Philip Bloom when we discovered his work of past Flash Sale destination Las Vegas. We were thrilled to discover that he has also spent some time filming in this weeks Flash Sale destination too - Dubai. 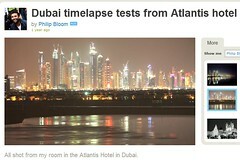 Bloom shot this video from the window of his room at the Atlantis Hotel and it looks like quite the view. Watch out for the moving lights on the buildings at night, they look like robots deep in conversation! Have you visited Dubai? What did you think of the city scape? For details of previous Flash Sales and to be kept in the loop about any upcoming ones click here.